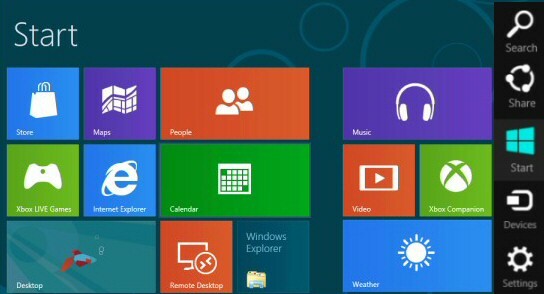 Here are tips on how to install the Windows 8 RTM (Release to Manufacturer), or regular version. Trap 1: Get the product key! Unlike the developer beta, regular versions of Win 8 require a genuine product key. You are looking for a 20 digit string such as: DBJXZ-8XBW8-4328T-B23TX-BGUYJ. Confession: This was a case of more haste less speed, a combination of tiredness and over-excitement caused me to type the Sha-1 hash numbers instead of the product key! I can laugh now, but please don’t repeat my mistake! Trap 2: Be patient during first 4 minutes. My initial install screen froze for at least 4 mins; I even restarted the boot loader procedure twice until the penny dropped, I realized that static screen with the fish was not going to do anything for 4 minutes! Trap 3: Go for a clean install. People who go for an upgrade from Windows 7, or Windows 8 Developer Preview sometimes get a problem at about 90% completion. As you can neither upgrade to the RTM version, nor downgrade to the previous OS, a clean install makes the most sense. Research a URL to download the Windows 8 .iso file. You need a product key for this installation. Recommendations: Install Windows 8 in a Virtual Machine, or alternatively, use an old laptop as a test machine. To really get to grips with the Metro-style UI install Windows 8 on one of these systems: HP Elitebook 2760p convertible, ASUS EP121 tablet or a Dell Inspiron Duo convertible. Strange but true: People asked for 64-bit versions of Windows 8 (and 7) to run in Virtual machines, but when Microsoft deliver 64-bit compatibility, most people choose to install 32-bit versions for ease of use and performance reasons. When I tried to install Windows 8 on an old laptop it stalled due to a compatibility problem. Once I updated the XP driver to Windows 7, the install carried on from where I left off, there was no need to start all over again. Clever stuff – appreciated. My research also discovered that Windows 8 install will incorporate the Upgrade Advisor and the lovely Windows Easy Transfer. Even in Windows 7 these were separate products, handy to have them bundled in the Windows 8 setup experience. One of its cleverest features is the way Windows 8 adapts to a huge variety of form factors, it recognises computers with our without keyboards and different screen widths, and adapts accordingly. Nevertheless, if possible choose a recommended screen size, so that you can activate the menus near the screen edge. For years techies have been downloading software from TechNet then installing it. Microsoft is now going to extend this principle for members of the public to install Windows 8. Thanks to digital delivery, Microsoft will sell downloads of Windows 8 anyone who has a credit card, thus saving people having to go out and buy a physical disc from a store, or place an internet order with postal delivery. There were some pleasant surprising when I upgraded TO Windows 8 RTM. Amazingly, you can upgrade to Windows 8 Consumer Preview from Windows Developer Preview. Less surprisingly you can upgrade from Windows 7, Windows Vista, or Windows XP. More good news if your machine is a member of a domain, you can upgrade a Windows 7 Pro (domain member) to a Windows 8 Pro (domain member). Incidentally, this was the same successful procedure success as upgrading from a Vista machine in a domain to Windows 7. 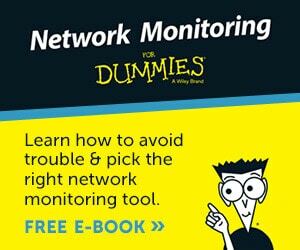 Many want a fast no-hassle install, or more likely an upgrade. Those who take this option get a web browser interface and can download the files from the internet. These users sacrifice the ability to customise, but gain in speed and simplicity. For techies it’s important to control what’s installed. They are happy to install from a DVD, or possibly a USB stick. Speed of choosing the settings is not a primary consideration, indeed these users love to explore all possible options. I began by downloading the 32-bit .iso file of Microsoft’s Windows 8 onto my Windows 7 machine. I chose this version because at 2.8GB I knew it would fit on a regular DVD. Once it finished downloading, I right-clicked the .iso, selected ‘Open with’ and chose the native Windows Disc Image Burner. Just in time, I inserted a 4.7GB DVD and allowed the burning to proceed. Incidentally, I could have used a USB flash drive to create this bootable disk. I hear that the Windows 7 USB DVD Download Tool will prepare your USB stick for the .iso image. A clean install on an old laptop. Setup reformatted my C:\ drive as part of the install. Install on a virtual machine inside Windows Server 2008. I started with an existing Windows 7 machine and asked the Windows 8 setup to preserve the old settings, this meant I kept my user accounts, machine name and IP address. What’s new here is that Windows 8 File Transfer moves whole folders rather than individual files, thus reducing the number of calls for a file operation. In the case of a Windows 7 upgrade, you start setup inside the old OS by running the DVD. Thanks to new intelligent routines, install scans for the existing OS language and provides check-lists of compatible (and incompatible) programs. Alternatively, you could eschew old settings and select a clean install. Now you can dual boot provided you plan ahead and create a 50 GB partition BEFORE you begin the Windows 8 install. The trick is to select ‘Custom’ during the first section of the setup. You get the full set of installation options in the final phase of setup. The key decision is ‘Express’ or ‘Customize’, I hit customize just to see the choices. You can use a command-line tool called to Recimg to set a new Refresh Point. This is the command which I ran from the command-line. 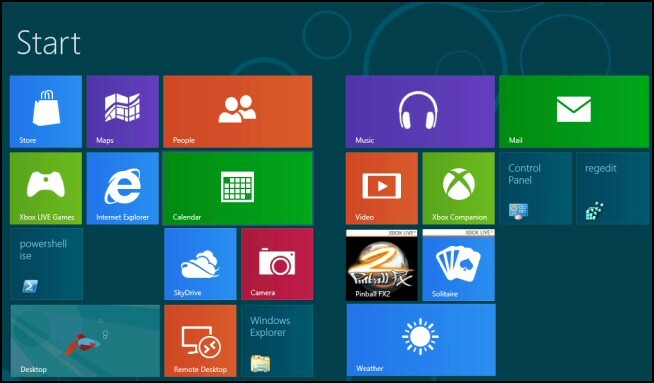 UEFI is an alternative to the BIO; either one can prepare the motherboard to load an operating system such as Windows 8. UEFI supports ‘Secure boot’, one benefit would be stop malware loading before Windows 8. Many experts in Malware claim that this not a common method of viral infection. Secure boot works on code signing principles. Microsoft will sign the Windows 8 boot loader and a public key will be burned into the UEFI chipset. Your Windows 8 boot loader is signed with a corresponding private key, so your operating system works as you would expect. The main reason that this is a hot issue is that Secure Boot would prevent you from loading an alternative such as Linux. Using a WDP Universal Language Installer and the Win8Lang files you can choose to change from say English USA to ZHH – Chinese (Hong Kong). Go to the Control Panel, Hardware, Clock, Language Region and Add Languages. As my Windows 8 was 'born' it did not ask for a computer name or IP address, it got these from the previous (now over-written Windows 7) machine. Here above is the App Bar displaying the tailored ‘Metro-style’ programs. Each app can be run full-screen and is immersive. Developers will be inspired by the September 2011 BUILD conference to write more apps in HTML 5 or a .NET programming language. The biggest news in Windows 8 is the disappearance of the Start Button. For those who bemoan its loss I say this: ‘Think of the whole Metro UI as one massive start button’. Voila! there are your icons; and if you want to ‘Search’ – just start typing! At first I found it difficult to access the 5 ‘Charm’ buttons in general and ‘Start’ in particular. What seemed to happen was that the ‘Charms’ appeared ONCE then remained hidden. What then worked best for me was to drag the mouse downwards the very bottom right of the screen. Once I had the knack it was easy, as it would be if I had a touch-screen. Here are the 5 ‘Charms’: Settings, Devices, Share, Search and of course, Start. They appear on the Edge UI when you swipe to the right side of the screen. 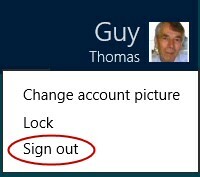 How to log off from Windows 8 perplexed me. I kept clicking on the Start button, and the Desktop, after going around in circles for longer than I care to admit, eventually I clicked on my username / icon, and there it was ‘Log off’ was now Sign out! (See screenshot right). Once logged off, I found the Windows 8 Shut down power button at the lower right of the main Lock screen. A better way of shutting down is clicking on the ‘Charms’, Settings from where you can see the same Power button. You have two choices of logon methods: New Microsoft Account or traditional domain or local account. I accessed ‘User accounts’ via the Control Panel and added more users. Getting started with this version of Windows 8 really was straightforward especially if you got the correct product key, and were patient during the first 4 minutes of the boot loader stage.